I have now completed edging and stitching together the central twenty-five squares for the masterpiece – these are all made by me and you can read about the significance of each one on my masterpiece page. Overall, they represent nine permaculture designs, the permaculture principles and ethics plus some aspects of design work in general. I do have several more squares in hand (mainly meditation squares – made when I wanted to do something with my hands whilst my mind was otherwise occupied), but I’m not adding these just yet. The next additions are going to be yours… some are here already, some are on their way, some are not yet made, but will be. If you would like to contribute, but can’t crochet or knit, then I’d love you to write something for my scrapbook… the details are here if you are interested. I’m planning to collect contributions up until about Easter time. so there’s no rush. And many, many thanks to those of you who have already sent a square or a piece of writing… I am deeply touched. 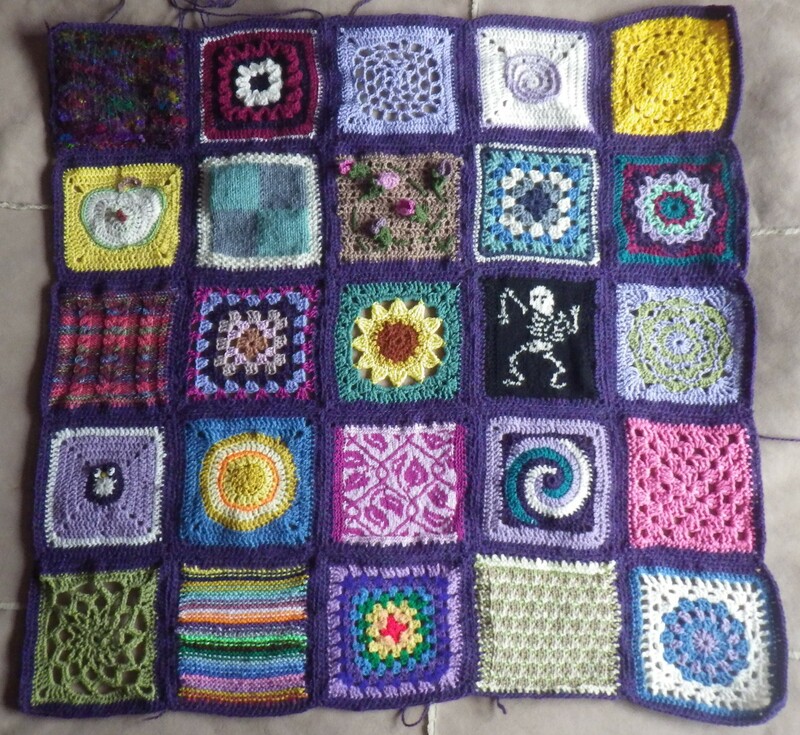 Oh, thank you… I’m just starting to do the edges on the donated squares and then those can be sewn in… I’m really pleased with how it’s looking so far. Now that it’s coming together, you can see that it’s going to be extraordinary. Not just for the fact that it’s a collective effort, but because despite the widely disparate sources, materials and ideas behind each square, the whole is harmonious and beautiful now, and will be even more so when it’s finished. I have been consciously trying not to ‘plan’ too much and it seems to be working so far. The only thing I am trying to do is to spread out the brightest squares across the work, so that there is balance. You are right, though, I would never have expected such a wide range of designs to look so good together. I’m really pleased, though, that I didn’t choose to edge the squares in black. It reflects the nature of the maker. Beautiful. May many more arrive for you. S T U N N I N G in every way. Thank you so much. We are fortunate in that we live on a hill… although water does flow into our garden from the field behind and then out again. The weather is so bad, however, that Henry, our postman, has stopped wearing shorts! !